I've actually been a little distracted this week as far as my projects go, but I have a good reason. 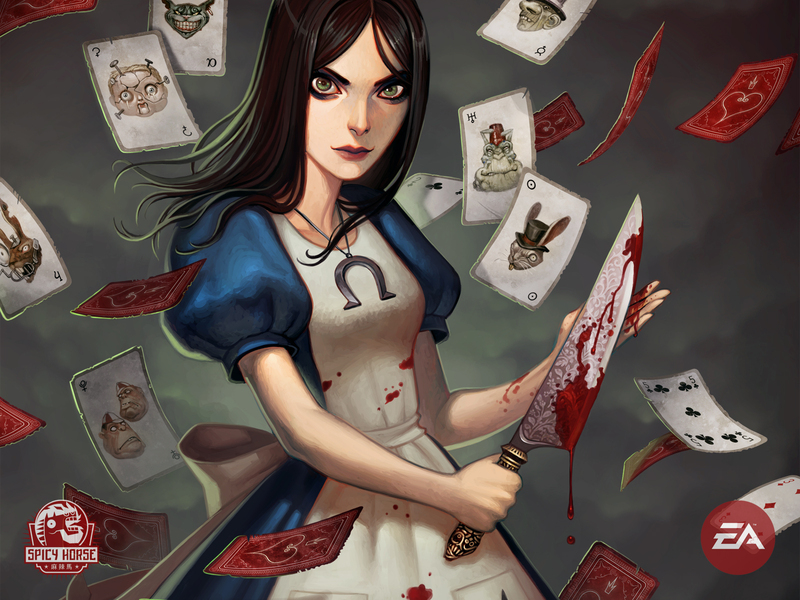 Alice: Madness Returns video game!!!! Yes!!!!!! I played the first PC game years ago but never finished it and then I switched to a mac. Now they created a sequel and it's for the PS3 and Xbox. I love anything Alice in Wonderland related so I was instantly drawn to it. I might not be the best person to rate a video game since I really am not a gamer, but I think this game is exciting, creepy, challenging, and just, gosh darn it, FUN! The best part of this new release is that they included the original first Alice game that was only made for PC. I actually have a second shot at beating the first game! Ok. Sorry for this gaming interruption. Now back to the crafting. "So what's in my project bag these days?" you ask. Good question. First up: cross stitch! A few weeks ago I was lucky enough to stumble on this little gem at Barnes & Nobles. This is my first attempt at cross stitching. They give you supplies for the three patterns on the cover of the box in the red circles. I started on the Rest in Peace zombie hand. Not at full zombie strength. It's definitely challenging and more time consuming then I thought it would be, but now that it's resembling a green hand, I'm happy. I hope my technique gets better as I go. I've seen all the awesome work that Mr X Stitch and Feeling Stitchy posts and have become inspired to make my own original pieces after this completion. Although, I think I might prefer embroidery more. I bought quite a few supplies from Sublime Stitching and tons of DMC floss and am raring to go! My goal is to get the complete DMC floss collection (not including the satin and variated colors) so that I always have a working palette at my fingertips. I drew up some patterns of my own and am excited to share them with you when they're ready. I've been knitting for a long time but there are tons of garments I've never made before. One thing on that list is a shawl. Now, I didn't think I would be a shawl-loving girl, but when made shorter, it makes the most awesome triangular scarf! I had my eye on Knit 1. magazine's Triangle Lace Shawl for awhile. One of many glass beads. It requires applying beads with a super tiny crochet hook to the center of every little flower that graces this Misti Alpaca Lace scarf in carbon steal. It's several repeats short but it still has the same great look. You start out with 5 stitches and then increase every other round to get hundreds of stitches, making every row longer and longer to get through. It's been a little tough now that it's reaching an end, but I'm happy it's almost complete. My next knitting project, after the completion of the above mentioned, will be another shawl. This time it will be Jared Flood's Rock Island Shawl. I bought the Lorna's Lace wool that he specifically designed for this piece.